If you’re going to be putting in work on your car, you’re going to need a great floorjack. But you probably don’t buy floorjacks often. You have to rely on your floorjack to keep the car off of your head, so you don’t want to purchase the wrong one. In this article, we’ll walk you through a few of the best floorjacks on the market so that you will know what to look for when you buy one for yourself. By the time you’re done, you’ll be racing to jack up your car and get to work. How Long Should My Floorjack Last? How Do I Know If My Floorjack Can Jack Up My Car? How Do I Pick A Floorjack For A Car With Odd Dimensions? How High Does My Floorjack Need To Jack? Now that you’re acquainted with the strongest and the tallest floorjacks it’s time to analyze what features you need from your floorjack to have a safe and successful car repair session. First, your floorjack needs to protect you while you are working. The jack is responsible for holding the car up in the air. Cars are heavy. Most floorjacks are rated to three tons, but some are rated for less. Do yourself a favor and get a floorjack that is rated for three tons. Even if you don’t plan on jacking up cars that weigh that much, you will appreciate the added assurance that you are operating well within the jack’s weight range. Safety goes beyond mere weight requirements, however. You should also opt for a floorjack that contains safety features which prevent you from using the jack incorrectly. When you are using a floorjack, it is possible to accidentally overfill the jack. Overfilling the jack gives it a bit more height than it would otherwise have at the expense of safety. Good floorjacks have an overflow valve which prevents you from overfilling the jack in the first place. Likewise, good floorjacks have a bypass valve which will, in theory, prevent the jack from crashing down in the event of a failure somewhere else. The bypass valve is a great safety feature, but using the jack properly in the first place might make it redundant. 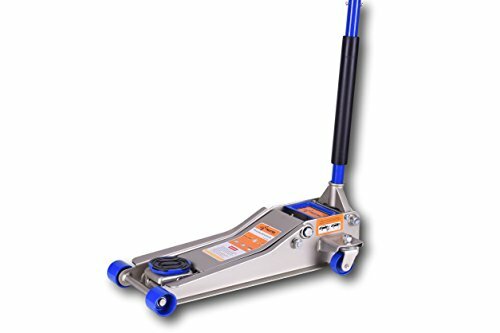 Aside from safety features, the best floorjacks use multiple pumps. Adding more than one pump helps you to exert less effort while you are raising the car. Especially if you plan on jacking up more than one car per day, you will need a floorjack that magnifies your strength more than others. There is a tradeoff with additional pumps, however. Each pump is heavy and contributes significantly to the weight of the floorjack. Most floorjacks have wheels or castors — critical features –, but excessive weight can still make them a hassle to use. Remember that the easier it is for you to jack up the car, the heavier the jack itself will be in almost all cases. If you plan on leaving your jack mostly in one spot, the weight will not be very much of a concern. You will need to maneuver the jack into position for each car that you jack up, however. For most purposes, two pumps are the sweet spot between jack weight and ease-of-jacking. Finally, good floorjacks are durable. Floorjacks are built to withstand high amounts of pressure, and you want to be able to rely on your jack to weather that pressure effectively. That’s where less durable floorjacks will start to give you anxiety, even if they don’t break. The Blackhawk B6350 Black/Red Fast Lift Service Jack is a reliable and novice-friendly floorjack which you can use right out of the box. This floorjack’s cheerful red exterior belies its great feature set. Especially for novices, the over-pumping protection bypass device is a lifesaver. The bypass device will prevent you from accidentally setting up an unsafe jack by jacking too high while also preserving the lifetime of the unit. The swivel-saddle features of the floorjack are also helpful, especially if you don’t have a naturally good feeling for how to position the base of the jack. You will have a slightly higher tolerance for error in your jack positioning with this floorjack than you would with others. Overall, the build quality of this floorjack is fairly high. While it isn’t a top-of-the-line unit, it will be more than sufficient for occasional jacking. 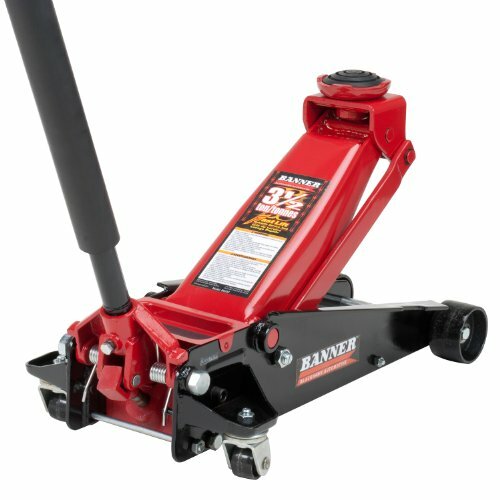 The Torin Big Red Hydraulic Trolley Floor Jack: SUV / Extended Height is an inexpensive yet functional floorjack which provides a lot of height capability at the expense of ease of use. 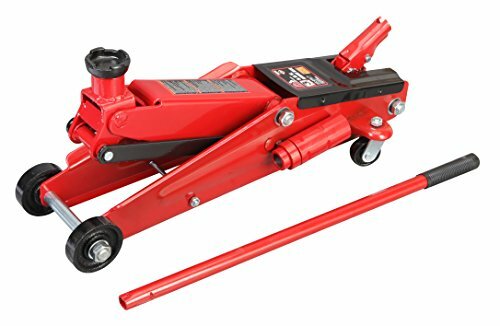 If you plan on jacking up cars that are a bit bigger than your average compact, it pays to invest in an extended height floorjack like the Torin Big Red. It’s tough to find another floorjack that can jack as high as the Torin at the same price point. You’ll be able to jack up to 21 inches in the air. While the Torin does have 360-degree swiveling casters to help make positioning a bit easier, the jack itself lacks a few features like a bypass device. Because it doesn’t have these features, you should take care to understand how to reach the maximum height of the jack safely. Beginners may not want to test their luck with the Torin. Experts will have no problem using it, however. The Pittsburgh Automotive 3 Ton Heavy Duty Ultra Low Profile Steel Floor Jack with Rapid Pump Quick Lift is a tried-and-tested floorjack that combines high durability with a basic feature set to appeal to professionals who plan on using their equipment until it breaks. Pittsburgh Automotive’s floorjack is simple but durable. Surprisingly, the unit is fairly lightweight, meaning that you won’t need to struggle while lugging it from storage into the garage. The low profile of this jack makes it ideal for cars which ride very close to the ground. The overall jack height of this floorjack isn’t the most impressive, nor are its ease of use features. You may even need to lubricate the jackshaft from time to time. On the other hand, this jack is nearly indestructible. Professional car mechanics will appreciate this jack’s maneuverability and durability. Novices may struggle with the fact that only one set of the jack’s wheels are swivel-castors, and that there is not an automatic pump bypass device. The Liftmaster 3 Ton Heavy Duty Ultra Low Profile Steel Floor Jack with Quick Lift is a top-of-the-line floorjack that has a feature set which will make every mechanic jealous. With a three-inch low profile and a high jack, the Liftmaster has a lot to brag about. Thanks to the Liftmaster’s Quick Lift dual pump system, it takes very little effort to make a car weighing a couple of tons jack into the air. As far as positioning goes, the castors are effective at making it a snap. Furthermore, the castors are protected but also padded. This means that you won’t have to worry about something damaging the castors — or the castors damaging your body when they scrape against you by accident. The jack’s other safety features are impeccable. The bypass device works effectively, and all of the sharp edges of the jack are protected by a bumper to avoid harming anyone else. These bumpers also help to protect the vehicle getting jacked from any unwanted scrapes. The Arcan ALJ3T Aluminum Floor Jack is an ultra-durable jack which is built to last until the end of time. 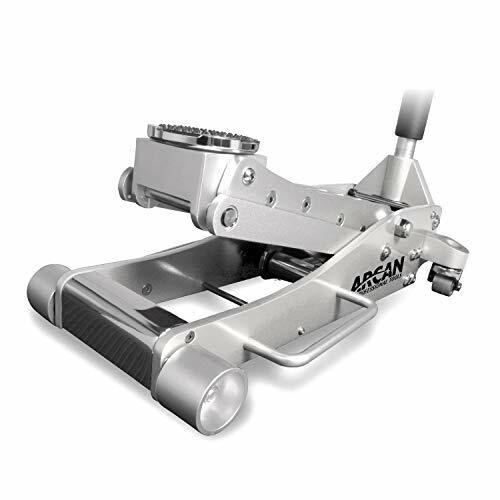 The Arcan ALJ3T is the most heavy duty floorjack that we’ll review today. This floorjack is built like a tank. All of the aluminum sidings are anywhere between two and ten times thicker than other equivalent jacks. Because the jack is made out of aluminum, it can accomplish this massive skeleton without weighing a ton. While it’s still heavier than most other floorjacks even the heaviest of abuse will leave the unit fully intact. The aluminum siding tends to scratch easily, but the other features of the jack more than makeup for it. The gripping handles on the sides of the jack are a great aid in positioning the jack exactly where you want it. Though there is only one pair of swiveling castors, you won’t need to replace them anytime soon. Furthermore, you won’t need to worry about jack failure causing injuries. There is a bypass valve and also an overload valve, which will force you to use the jack safely. Floorjack lifetime depends on how frequently you use it and how well you take care of it. If you take good care of your floorjack by avoiding mechanical trauma, cleaning it often, and lubricating the moving parts, a floorjack will last a long time. If, on the other hand, you are regularly putting your floorjack through a high amount of stress, it won’t last as long. In general, floorjacks are very durable pieces of equipment. You should plan to buy one floorjack per decade. Most floorjacks are rated for three tons of jacking. Luckily, you don’t need to speculate about how much weight your floorjack can support. At the bottom of the floorjack, there should be a large sticker or engraving on the face of the jack. The engraving should tell you the jack’s maximum and minimum jack heights, weight tolerances, and basic operating instructions. Compare the dimensions of your car to the instructions and see if your car falls within the range. As a rule of thumb, three-ton jacks should be enough for consumer cars and SUVs. Any larger vehicle should be weighed first. Floorjacks come in all shapes and sizes. This includes shapes and sizes intended for very low, very high, or very wide cars. The statistic which you need to examine is the jack’s minimum and maximum heights. Cars that ride very close to the ground will need to be jacked up significantly higher — sometimes by as much as 12 inches — than those that ride at a normal level. There are typically jacks which advertise themselves as suited for these cars. Importantly, the jack itself must first be small enough to fit under a low-riding car! If the jack can’t be snuck underneath the bottom trim, there is no chance that the jack will work to jack up the car on its own. This is why there are certain jacks with a very slim profile and others which make no effort to sprawl upward. The standard floorjack height capacity is around 21 inches. For most cars, this will be a sufficient amount of jacking. Remember, you need to jack the car high enough such that you can roll yourself underneath it and have a comfortable room to work. Depending on your body’s depth and the height of your floor roller which you will lie on, the car may need to be jacked higher. Most floor rollers are only three or four inches tall, but some may be as much as six inches tall. 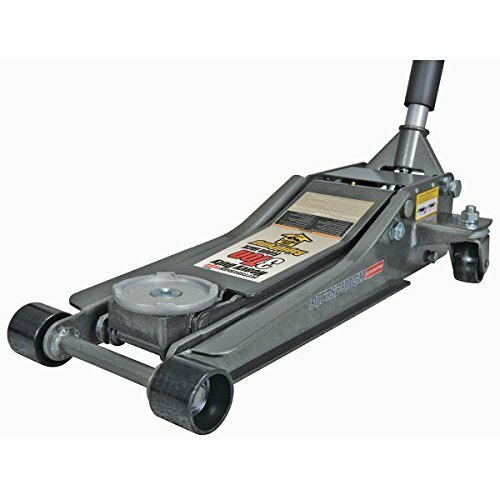 Every additional inch which on your floor roller is another inch that your floorjack will need to hold up the car. Likewise, if you’ve been drinking a few too many beers or eating too many burgers, you’ll need to jack up the car higher depending on your waist size to remain comfortable. Your arm length is also a relevant factor in the height of your floorjack. You typically will be working with bent arms rather than fully extended arms. If your arms are fairly long, you will still need to jack up the car a few inches higher to give yourself room to work with a bent arm.